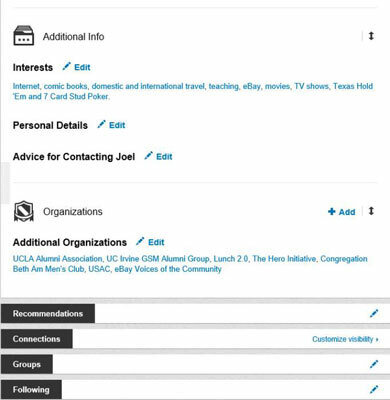 There’s more to you than your jobs and education, and LinkedIn has two sections, Contact Info and Additional Information, to tie your LinkedIn profile to your other Internet and real-life identities. 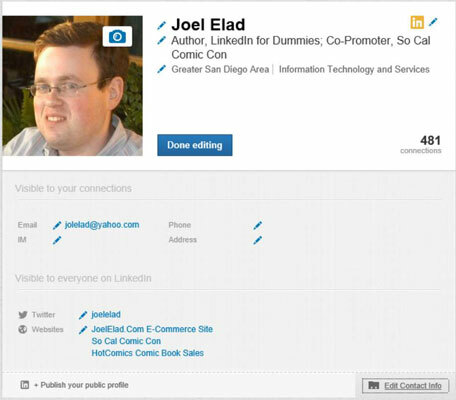 Websites: LinkedIn allows you to add up to three different website links, which point from your LinkedIn profile to whatever website(s) you designate, such as your personal website, your company website, a blog, an RSS feed, or any other promotional mechanisms you use online. 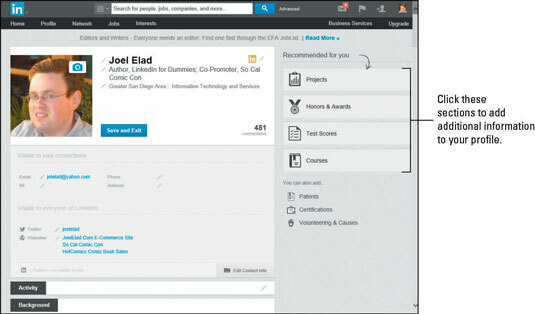 Adding a link from your LinkedIn profile to your other websites helps boost search engine rankings for those pages. Those rankings are partially determined by the quantity and quality of web pages that link to them, and LinkedIn is a high-quality site as far as the search engines are concerned. Note: You must make your profile public to receive these benefits. Twitter: You can link your Twitter and LinkedIn accounts so that your Twitter updates show up on your LinkedIn profile, and your LinkedIn network activity can be tweeted to your Twitter followers automatically. 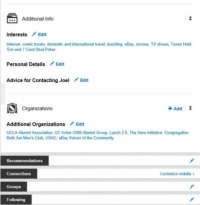 Interests: Highlight your extracurricular activities to allow potential contacts to see what they have in common with you (favorite hobbies or sports) and give potential employers a glimpse into what else interests you outside a job. Groups and Associations: Illustrate what organizations you belong to and what formal activities you do in your spare time. Many people use this section to highlight charity work, networking groups they belong to, or affiliations with religious or political groups. These items are completely optional for you to complete, but a strong, well-rounded profile usually helps you in your career or networking goals because it gives you more opportunities to connect with someone or allows people to identify with your situation. 1Go to LinkedIn and log in. Click the Profile link in the top navigation bar. 2On your profile page, click the Edit button. Click the Edit Contact Info link below your profile picture, name, and headline. You see an Expanded contact information section where you can update your contact information, including e-mail, phone, IM, and physical address. Click the Edit link (the pencil icon) to add the appropriate information. 3If you want to update your Twitter setting, click the Edit link next to the Twitter header to bring up the Twitter Settings page to add or edit your Twitter account that's connected with LinkedIn. 4Under websites, in the drop-down lists on the left, select short descriptions for the sites you intend to display. You can pick from the predefined list of descriptions. 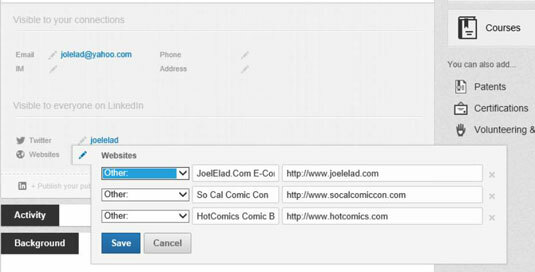 Or, you can pick Other; in the blank text box that appears, type in a brief custom description for your website link. This description appears as a link on your profile — the reader doesn’t see the site’s URL. 5Still in the websites section, in the text boxes to the right, enter the URLs of the websites you want to list on your profile, corresponding to the correct descriptions on the left. You can add up to three URLs to your LinkedIn profile, so use them wisely. This might seem obvious, but, well, people are going to be able to click those links and check out your websites. Sure, that’s the point, but do you remember that tirade you posted in your blog about a co-worker or tough project? Before you link to a site from your LinkedIn profile, scour it and make sure you won’t end up scaring off or offending your contacts. 6Scroll down your profile until you get to the Additional Info section. Click the Edit icon to complete the Interests text box. Use this section to tell the world a little more about you besides your jobs and education. Make sure to separate each interest with a comma. You probably want to omit any interests that a potential employer wouldn’t like to see. For example, if you work in the entertainment industry, talking about how you love to download pirated movies will not make any hiring manager happy. Talk instead about how you love to watch licensed content from approved sources like iTunes or Amazon Unbox! 7When you're done, click the Save button. Scroll down and click the Edit link next to Additional Organizations to fill in your other groups and associations. Here you can list your groups not listed under any school, such as any charity groups, religious organizations, alumni associations, and rotary clubs. This step updates your Additional Information section in your profile, and you’re taken back to your profile page.